improved negotiation and problem-solving skills. We provide family mediation training, family arbitration training, and parenting coordination training to hundreds of students each year in Greater Toronto, throughout Ontario, and across Canada as well as internationally. 1) apply to all Ontario FDR designations; 2) are taught by experienced family mediators, academics, and thought-leaders; 3) are dynamic, hands-on and current; and 4) build on core mediation principles: conflict assessment, negotiation theory, power dynamics and the law. Our unique program in International & Civil Mediation Training grew from training we provided to government officials, police officers, and community leaders throughout the Caribbean (St. Lucia, Grenada, St. Kitts, Guyana, Belize, Dominica, Barbados) for The IMPACT Justice Project. With its practical combination of theory and practice, this 40-hour International & Civil Mediation course will equip anyone seeking to develop their mediation and negotiation skills in a community, organizational or legal context. We have designed custom Alternative Dispute Resolution (ADR), negotiation and civil mediation courses, as well as family mediation training courses for organizations around the world. We know how to delve deeply to understand the issues that matter in conflict, not just negotiating positions. Our experienced mediation trainers can create a specific version of any of our standard courses or can design a tailored course just for your company, organization, or government. Lead Family Mediation Trainers (from left to right): Elizabeth Hyde, Hilary Linton. See our team of skilled mediation co-trainers and coaches. Your work offers us the ability to make our mediation and collaborative process safe. It offered me a whole new way of working, of being able to reach far further along the continuum of challenging couples and of doing this work with far more satisfaction. Mediator and Arbitrator, Family Law in Partnership, London, U.K.
IMPACT Justice is a Canadian-funded project being implemented from within the Caribbean Law Institute of the Faculty of Law, University of the West Indies, Cave Hill Campus. 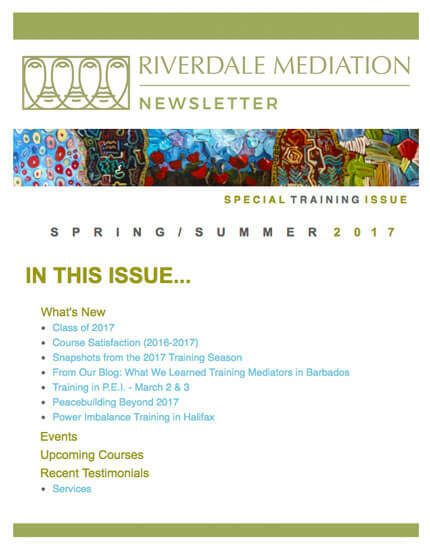 We have used Riverdale Mediation to train mediators including police officers, social workers, probation officers and persons from many other disciplines in Barbados, Belize, Dominica, Guyana, St. Kitts and Nevis and St. Lucia during 2016/17. The Riverdale Mediation trainers are extremely professional in their approach, are knowledgeable, adaptable and know how to make trainees feel comfortable. We have had nothing but glowing comments from the many persons they have trained under the IMPACT Justice Programme. Riverdale Mediation was highly recommended to us from our ADR colleagues from across the country. Hilary and Elizabeth delivered a high-quality, practical, and interesting 2-day family law arbitration training to over 20 dispute resolution professionals in PEI in March 2017. The feedback we received from participants in their post-training evaluations was glowing. Hilary and Elizabeth brought a wealth of knowledge and experience to the training and were effective communicators and teachers. Hilary’s approach to presentation is affable, easily digestible and highly informative. Hilary was willing to share all her knowledge in an open and constructive manner, dealt with difficult questions and imparted her knowledge with abandon. All our delegates were highly impressed with the professional and capable manner in which her presentation was delivered and the knowledge imparted. Family lawyers should consider the training offered by RM to be mandatory professional development. Hilary and Elizabeth methodically teach the theory and practice of interest-based negotiation, rapport building and conflict management. More importantly, the diverse group of professionals that Riverdale attracts creates a unique learning environment for the exchange of fresh perspectives. I really enjoyed Jared's teaching style. He was engaging and knew a lot about the topics. The course (Family Relations, January 2017) was extremely interesting and applicable to my work. Each year, we provide supervised hands-on mediation experience for between 10 to 15 mediation and parenting coordination students.